7-minutes Yoga Meditation Visualized: This 7-minute video summarizes the process of Yoga Meditation. It is based on several graphics similar to the "circles" graphic above, although it does not specifically address the Om Mantra as such. Oms on the printed cloth on the wall: Vaishvanara, the gross realm of the waking state and the conscious mind. 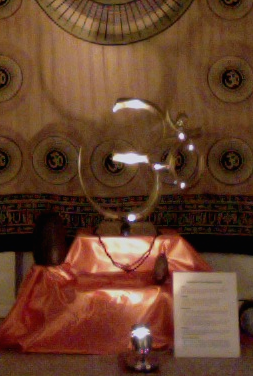 Shadow of the brass Om: Taijasa, the subtle realm of the dreaming state and the active unconscious mind. Brass Om: Prajna, the causal plane, the deep dreamless sleep state and the latent unconscious, the domain of samskaras that are the driving force of karma or actions. Lingam: Shiva lingam is the primary ground for manifestation. It is hiranyagarbha, literally the golden womb. On the inner journey it is experienced as the bindu that is pierced, transitioning to the realization of the Absolute Reality, Brahman, Shiva that is one and the same with Shakti (which is symbolized by the light, below). Light: Turiya, the fourth state of pure consciousness, Atman, Shakti, which projects outward through the deep impressions of the causal (the brass Om), manifesting in/as the subtle (the shadow) and, in turn, in/as the gross (the Oms on the wall cloth). See also: The four main levels of Consciousness (A, U, M, and Silence of OM Mantra) are also described in the article Levels and Dimensions of Consciousness. These levels exist universally: It is important to be aware of the fact that these levels of consciousness are realities that exist universally, regardless of whether or not one uses the OM Mantra or the visual OM symbol in any way. In either case, the underlying principles are extremely useful for all seekers in purifying or clearing the mind, and seeking the direct experience of deeper truths. 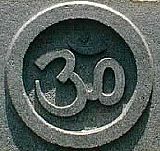 Meaning of the symbol: Not only does the sound vibration of the AUM/OM represent the four levels of consciousness, so too does the visual symbol. The arc below the dot symbolizes the separateness of this fourth state, standing above, though ever remaining part of the other three. Piercing the bindu finally allows one to attain the highest experience, and this comes after following the process of Kundalini Awakening. you can carry around for a while to memorize the parts of Om. Other names for the four levels: Different texts and teachings might use different names for different characteristics at these four levels; for example, virat, hiranyagarbha, ishvara, and brahman, as well as vaishvanara, taijasa, prajna, and turiya. Roadmap for direct experience: The Yogi does not use the information about these levels as mere intellectual fodder. Rather, the OM Mantra is a roadmap for sadhana, spiritual practices. It is not for the person who seeks only the shallow waters of spiritual life, but rather for those who strive to experience nothing less than the depth of the Absolute Reality in direct experience. It is important to know that OM Mantra is very often used in conjunction with other mantras, usually with the OM being the first or last sound in the whole mantra. Often these other mantras refer to a specific deity or name of God. Some practitioners consider the OM to literally refer to only one such name of God or deity. Still other practitioners believe the OM refers to some different God or deity. For those born into such religious cultures, this diversity of use of OM is well known, and does not cause confusion, while also being aware that there may be discourses or debates supporting one view or another. However, others who are not familiar with this will benefit by becoming aware that there are a variety of ways of using OM Mantra. This leaves it a matter of personal choice how the OM Mantra will be used. Regardless of how one uses the mantra, there is a universal truth that the vibration of OM will be experienced on the inner journey. In that sense, is not a mere belief or symbolic tool belonging to any one group or groups. Similarly, the existence of waking, dreaming, sleep, and that beyond (described below as represented by AUM) are also universal realities. In the information below, OM Mantra is presented as a means of contemplation and meditation, which pierces the three levels of reality and consciousness, revealing the fourth, which permeates the other three. The OM Mantra (AUM Mantra; Pranava) is a widely recognized mantra. While the OM Mantra has a variety of meanings, one of its most significant uses is for Meditation and Contemplation in Yoga and Vedanta. The OM Mantra is recommended in the Yoga Sutras and the Mandukya Upanishad, as well as in many other teachings. Latent impressions begin to stir: We come to see, in direct experience of Yoga Meditation and Contemplation, how it is that there are latent impressions in the deep unconscious (the place of Deep Sleep; M of OM Mantra), and how it is that consciousness drifts over these latent impressions, causing them to stir from the Causal level (M of OM Mantra). These impressions arise into internal action: Then we see the way these impressions then arise into action internally in the Unconscious (the Active Unconscious associated with unseen mental processes and the Dreaming Sleep level; U of OM Mantra), forming many invisible thought processes, normally only experienced in dreams (this is similar to what psychology calls "primary process"). These stirrings come forward into the conscious: Then we see the intriguing way in which those stirrings in the Unconscious (U of OM Mantra) come forward into the Conscious, Waking state of reality (A of OM Mantra), along with the way in which the indriyas, the senses (jnanendriyas of smelling, tasting, seeing, touching, and hearing) and means of expression (karmendriyas of eliminating, procreating, moving, grasping, and speaking) come into play so as to relate to the external world (A of OM Mantra). We can observe the four functions of mind: We come to see how the four functions of mind interact within these levels (A, U, and M of OM Mantra), including Manas (sensory-motor mind), Chitta (storehouse of impressions), Ahamkara (I-maker or ego), and Buddhi (which knows, decides, judges, and discriminates). In Waking state (A of OM Mantra), there is consciousness. In Dreaming state (U of OM Mantra) there is consciousness. In Deep Sleep (M of OM Mantra), there is consciousness. In active thinking (A of OM Mantra), there is consciousness. In unconscious process (U of OM Mantra), there is consciousness. In the latent storehouse (M of OM Mantra), there is consciousness. Who we really are, is the consciousness itself: We come to see that who we really are, is the consciousness itself, not the forms which arise. We declare with conviction, what the sages have said all along, "I am not my thoughts! I am That I Am!" Surface: The surface of the river (like the Conscious, Waking level, symbolized by the "A" of the OM Mantra). Consciousness at three levels: That reality or presence of existence itself, that is in the three levels of bed of the river, flow of the river, and surface of the river, is like the consciousness that permeates the three levels of Waking (A of OM Mantra), Dreaming (U of OM Mantra), and Deep Sleep (M of OM Mantra). Those three levels are also the Conscious (A of OM Mantra), Active Unconscious (U of OM Mantra), and Latent Unconscious or Subconscious (M of OM Mantra), as well as the Gross (A of OM Mantra), Subtle (U of OM Mantra), and Causal (M of OM Mantra) levels of reality. Subconscious: Our Subconscious wants, wishes, desires, attractions, and aversions (samskaras) are like those stones that form the bed of the river (M of OM Mantra). Conscious: Some burst forth into the Conscious mind (A of OM Mantra), resulting in actions, speech, and conscious thoughts, like the action on the surface of the river. Going beyond the three levels: Through practice, one gradually attains the ability to go beyond, or deeper than the various levels and thinking processes, to the direct experience of the source of the consciousness, symbolized by the Silence after the "A," "U," "M," of the OM Mantra. The practice begins simply, is practiced sincerely and faithfully, and expands over time, with ever increasing insights about the underlying truths contained in, and suggested by the OM Mantra. Meditation on OM (AUM) as an object of concentration, and Contemplation on its meaning work together in guiding one towards Self-realization. Tripura: Tri means three, and pura means city. Tripura is the consciousness that operates in the three cities of Waking (A of OM Mantra), Dreaming (U of OM Mantra), and Deep Sleep (M of OM Mantra), as well as the Conscious (A of OM Mantra), Unconscious (U of OM Mantra), and Subconscious (M of OM Mantra) aspects of mind. Sometimes conceptualized as the divine feminine (Shakti), compared to the divine masculine (Shiva), she permeates the three cities of the Gross world (A of OM Mantra), the Subtle plane (U of OM Mantra), and the Causal reality (M of OM Mantra). Tripura also permeates the many other trinities such as the beingness inherent in past, present and future. This is a Tantric rendering of the three levels of consciousness mapped out by the OM Mantra symbol, and its levels of Vaishvanara (A of OM Mantra), Taijasa (U of OM Mantra), and Prajna (M of OM Mantra). Dedication, devotion, love, and surrender into this creative source or divine Mother is one of the finest aspects of Tantra as a direct route to Realization. Some conceptualize Tripura as an anthropomorphic deity, while the subtler practices are directed towards Tripura as formless, that fourth state beyond the other three cities (A, U, and M of OM Mantra). 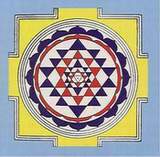 The Bindu of Sri Yantra is the symbol of this highest transcendent Reality (Silence of OM Mantra). The quality of the three cities is an aspect of OM Mantra, Gayatri Mantra, and Mahamrityunjaya Mantra. Explanations of the 7 levels of consciousness: Below are some explanations of each of the seven levels of consciousness mapped out in OM Mantra. As you go through the levels of the OM Mantra described below, it is best to remember that the key levels for practice are awareness of the four levels of consciousness related to "A," "U," "M," and the fourth level of Silence. "A" represents Waking: The Waking state of consciousness is represented by the "A" of the AUM Mantra. The name of this level of consciousness is Vaishvaanara. The Waking state (A of OM Mantra) is experienced by the individual person. In the Waking state of consciousness (A of OM Mantra) there are actions, speech, and thoughts of which we are "consciously" aware. 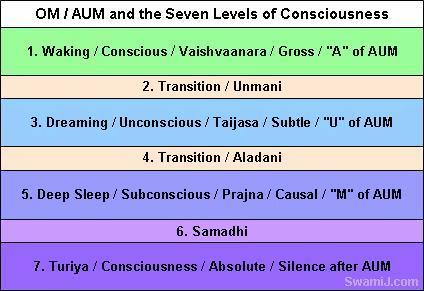 The unconscious processes in the deeper levels (U and M of OM Mantra) are also there, but just not normally noticed. Microcosm and macrocosm of Waking: If the individual person is the microcosm, then the whole of the manifest universe is the macrocosm. The "A" of AUM Mantra represents not only the individual Waking state of consciousness, but also the entire Gross realm. The individual state of Waking consciousness and the Gross realm are all operating at the same level of consciousness (both are "in the world"). The "A" bursts forth: When using AUM as a mantra, notice how the "A" bursts forth in an instant (whether said aloud, or thought of internally). You could say "Aaaaaaa...," in a drawn out way, but the "A" itself has a very brief, instantaneous bursting forth quality to it. The sound arises quickly, in a flash, from out of the silence. When using the OM Mantra, whether aloud or internally, it is useful to allow yourself to be aware of this bursting forth quality of thoughts, images, or impressions. All of these arise in a moment from the Subtler place within (U and M of OM Mantra). the Gross realm of the universe. Observing the "A" come forward: To observe the way the "A" comes forward when remembering the OM Mantra is to observe the way our whole process of thoughts, actions, and speech arises. This can be extremely useful to understand. We have all experienced this transition: We have all experienced this pleasant transition at times when about to awaken after a good sleep, and possibly when we are "day dreaming". In this state, you have left the Dreaming world (U of OM Mantra), but have not yet fully come into the Waking (A of OM Mantra), or external world. You might be lying there pleasantly, not remembering your name, who you are, where you are, and not really caring about these things. But you are also not asleep having any dreams. Increasing awareness of the transitions: When using the OM Mantra for Yoga Meditation and Contemplation, the focus is mostly on the three states of Waking (A of OM Mantra), Dreaming (U of OM Mantra), and Sleep (M of OM Mantra), which are also called the Gross, Subtle, and Causal. However, as it is practiced, there also will be a natural, increasing awareness of the transition phases as well. It will become clearer how it is that conscious (A of OM Mantra) thoughts, speech, and actions are transitioning from their underlying, mostly unconscious (U and M of OM Mantra) thought and emotional processes. Don't confuse this transition with Meditation: This very pleasant state is often confused with Meditation. Meditation is done in the Waking state (A of OM Mantra), in which one is full awake and alert. Then, gradually the veil is opened to allow the deeper states or levels (U of OM Mantra) to come forward into the Conscious, Waking state of awareness (A of OM Mantra). Parallels with science: In relation to the Gross world (A of OM Mantra), it is interesting to note the parallels between the transition between Unconscious and Conscious thought patterns, and the way the scientists describe the coming forth of the manifest universe as a "big bang". Possibly this too is a form of the coming forth of the Subtle (U of OM Mantra), transitioning into the Gross (A of OM Mantra). "U" represents Dreaming: The Dreaming state of consciousness is represented by the "U" of the AUM Mantra. The name of this level of consciousness is Taijasa(U of OM Mantra). Taijasa does not just mean dreaming. Rather, it is the name of that level of consciousness in which dreaming occurs (U of OM Mantra). Mind working out its desires: The Dreaming state (U of OM Mantra) is a level where the mind can work out its unfulfilled wants, wishes, desires, attractions, and aversions not allowed to play out in the external world (A of OM Mantra). Both Yogis and psychologists speak of this as a useful process. Microcosm and macrocosm of Dreaming: The counterpart of the personal Dream world (U of OM Mantra) is the entire Subtle, psychic, occult, or astral plane of reality (also U of OM Mantra). One is the microcosm, while the other is the macrocosm. Lifting the veil: As one progresses in Yoga Meditation, opening to the Unconscious (U of OM Mantra) begins. One stays in the Waking state (A of OM Mantra), but gradually lifts the veil, opens the curtain, so that the Unconscious (U of OM Mantra) begins to come forward. What comes is that which was normally only accessible in the Dreaming state (U of OM Mantra). Taijasa is not the "spiritual" realm: This level of Taijasa (U of OM Mantra) has often been confused as being the "spiritual" realm, failing to note that it is only the second of four levels of consciousness in AUM Mantra (or third of the seven). If one is not familiar with this, it can seem that there are only two realms (a Gross and Spiritual) with a Transition between them. One can easily get caught in a trap of pursuing the actions, beings, and objects of the Subtle realm (U of OM Mantra), not recognizing that they are merely a level to move through, not a place to go and stay. Journeys in these subtle realms (U of OM Mantra) are no more useful in the journey of Self-realization than journeys to a thousand cities in our external world (A of OM Mantra), though some such journeying is sometimes needed so as to learn the lesson that the journeying is not needed. The article Realization Beyond the Gross and Subtle describes how it can seem that there are only two levels of Gross and Subtler. Seeking the Subtle is a distraction: Patanjali, codifier of Yoga science describes many siddhis (powers) that come to the Yogi through practices. Some say that the Yogi is seeking these powers intentionally. However, Patanjali actually mentions these on the foundation of Non-Attachment (Vairagya) and Discrimination (Viveka), such that the seeker will abandon these powers when they come (See Yoga Sutra 3.38). In other words, seeking of the breadth of the Subtle realm (U of OM Mantra) is a distraction on the journey to enlightenment; with Discriminative Wisdom and Non-Attachment, one is better off to let go of these allurements. Witnessing and going beyond: At the same time that the Yogi observes and lets go of the Subtle realm (U of OM Mantra), there is also a beauty in witnessing as one moves forward in the journey. We can surely enjoy the scenery along the way, though it may be best, the Yogis remind us, to move on to the Realization of the Absolute, which is not subject to death, decay, or decomposition. Awareness of the transition: In the practice of remembering the OM Mantra, one allows the awareness and feeling associated with the "A" to transition into the awareness and feeling associated with the "U". the Subtle realm of the universe (Dreaming, Unconscious, and Subtle are all at the same level). The awareness of these three operating at the same level of reality (U of OM Mantra) is allowed to become clearer through practice over time. Forming the sound of "U": The actual sound is not like the letter "A" and the letter "U," but is more like "AOOUUUUU...." There is "Ah," followed by "UUUUU..." (as in shOE). Then there is "MMMMM...." leading to Silence. Transition between Dreaming and Deep Sleep: There is a transition stage between Dreaming (U of OM Mantra) and Deep Sleep (M of OM Mantra) states. The name of this transition stage of consciousness is Aladani. Aladani does not just refer to the personal experience between Dreaming (U of OM Mantra) and Deep Sleep (M of OM Mantra). Rather, it is the name of that transition level of consciousness itself. This transition is not normally experienced consciously: This is a state that one normally does not experience consciously. This state is very subtle. It is a transition (as is Unmani, between Waking and Dreaming, as described above), but is the transition whereby the latent, formless facts or impressions start to stir, and end up taking form in the Unconscious mind (U of OM Mantra), that part normally only accessed when one is having dreams while in the Dream state of sleep (U of OM Mantra). One may sometimes consciously experience the transition between Dreaming (U of OM Mantra) and Waking (A of OM Mantra), either while in bed at sleeping time or at Meditation time. This might be experienced as very beautiful or very horrifying, depending on the nature of the thought patterns. However, the transition at Aladani is very different from the Waking (A of OM Mantra) to Dreaming (U of OM Mantra) transition. Thoughts in their formless form: Here, in the Aladani transition, the thought patterns that are in their unmanifest, formless, latent form start to stir. This is literally the beginnings of the enlivening of latent Samskaras, the source of our Karma (the word Karma literally means "actions"). It is a process that one is not normally conscious of. Once again, it is very important to note that this is not the same as the process whereby Unconscious active mental process springs forward through Unmani into the Waking or Conscious state; this is happening at a deeper level. Beyond the Gross and Subtle: As attractive as the Gross and Subtle realm can be, these levels beyond Taijasa (the Dream State or Subtle realm) can be even more alluring and distracting. As one touches on this transition phase from which the Subtle realm and Subtle thoughts are born, one starts to see the way in which both the subtle and material realm are manifested and can be manipulated. Aladani and Aladin's lamp: Notice the similarity between the names of the level of consciousness called Aladani and the story of Aladin's lamp, wherein there was a genie. The genie was in latent form, but by rubbing the lamp, a transition process begins whereby the genie comes forth to fulfill any wishes. Between the stage of the genie being inside the lamp, and being fully formed, the transition of the genie is that of smoke that changes and solidifies into form. Moving past this transition level: For one truly on the path of Self-realization, this is a level to be acknowledged and moved past, allowing the stirrings to fall back to rest so that the Absolute can be experienced. "M" represents Deep Sleep: The Deep Sleep state of consciousness is represented by the "M" of the AUM Mantra. The name of this level of consciousness is Prajna. Prajna does not just mean Deep Sleep (M of OM Mantra). Rather, it is the name of that level of consciousness in which one experiences Deep Sleep (M of OM Mantra). Impressions are stored in their latent form: The Deep Sleep state (M of OM Mantra) is the level where deep impressions are stored in their latent form. It contains the roots of our habit patterns, the Samskaras that are the driving force behind Karma (actions). Those wants, wishes, desires, attractions, and aversions that play themselves out in dreams (U of OM Mantra), or turn into actions and speech in the external world (A of OM Mantra) have their root in this level of consciousness. Those impressions are like seeds, lying there waiting for water and fertilizer to awaken them, so they may grow in the fields of Dreaming (U of OM Mantra) or Waking (A of OM Mantra). Prajna is supreme knowledge: "Pra" means "Supreme" and "Jna" comes from "Jnana," which means "Knowledge". Thus, Prajna (M of OM Mantra) is the level of consciousness that is of Supreme Knowledge (M of OM Mantra). How odd it is, that the domain of Deep Sleep (M of OM Mantra), where there seems to be nothing going on, is called the place of Supreme Knowledge. Prior to the creation of thoughts and emotions: However, Prajna (OM of OM Mantra) is the place, the level that is deeper than, or prior to the creation of thoughts and emotions, whether in the Dream (Unconscious; U of OM Mantra) level or the Waking (Conscious; A of OM Mantra) level. Infinite library of wisdom: One who begins to gain access to this Prajna level (M of OM Mantra) also begins to gain access to what has been called the Infinite Library of Wisdom. This means direct experience of knowing, not merely from some form of contact with the Subtle realm (U of OM Mantra), but with the level out of which that Subtle realm arises. Storage and altering of samskaras: In this level of Prajna (the level of Deep Sleep; M of OM Mantra) is the storage of the formless, latent thought patterns (formless forms) called Samskaras that drive Karma, or action (A of OM Mantra). If one can gain access to the Samskaras (M of OM Mantra) while they are in this latent form, they can be more readily altered such a way that they lose their potency. Gaining direct access to the samskaras: There are a variety of techniques that professional and lay people use at the Waking level (A of OM Mantra) to indirectly affect changes in these deep impressions. Some of these can be very useful to spiritual aspirants in their journey. However, the Yogis want direct access to these deep impressions (M of OM Mantra) so that they can choose their own deep habit patterns. In this way, the Yogi gradually becomes a master over the Samskaras (M of OM Mantra) leading to his or her own thoughts, speech, and actions. Burning away the colorings: For the Yogi, this is a process of dealing with the roots of habits directly, through Yoga Meditation, Contemplation, and Yoga Nidra (described below). While the Yogi definitely cultivates the creation of new habit patterns, it is not merely pasting on another layer of habits on the top of the old, whereby one is left with inner conflict between the old and the new habits or Samskaras (that can play out unconsciously into actions and speech, as well as inner turmoil). The Yogi wants to attenuate and then burn away the colorings of fears, aversions, attractions, egoism, and spiritual ignorance (M of OM Mantra). Microcosm and macrocosm of Deep Sleep: These personal latent impressions or Samskaras are the microcosm, while the macrocosm is the Causal plane (M of OM Mantra) from which creation of the entire Subtle (U of OM Mantra) and and Gross (A of OM Mantra) universe emerges. This is why it is called the "Causal" realm or level of reality (M of OM Mantra). Those with great access to this level are sometimes revered, although even this attainment is short of the Self-realization that comes with the realization of Turiya, the Absolute Reality (Silent aspect of OM Mantra). The Yogis suggest that the aspirant turn away even from the allurement of the offer of such creative powers, and instead walk in the pursuit of the Highest Realization. The awareness of these three operating at the same level of reality (M of OM Mantra) is allowed to become clearer through practice over time. Prajna and Yoga Nidra: This level of Deep Sleep (M of OM Mantra), or Prajna, is the level at which Yoga Nidra, or Yogic Sleep is directed (Some incorrectly believe that Yoga Nidra is directed towards the transition level of Unmani, #2 above. That is only an early experience on the way to true Yoga Nidra). In Yoga Meditation and Contemplation, one remains in the Conscious, Waking state (A of OM Mantra), and gradually allows that Waking state to expand through the other states that are normally unconscious. However, in Yoga Nidra one leaves the Waking state, descends to the Deep Sleep state (M of OM Mantra), and yet, paradoxically, brings along Waking consciousness. Reducing samskaras through Yoga Nidra: Yoga Nidra is a state which allows one to experience thought patterns directly in their latent, hidden, or formless forms, and thus be able to reduce their power to play out due to habit. The phenomena itself of reducing the power of the Samskaras comes about naturally through the deep process of introspection during Yoga Nidra. That level of consciousness is the M of OM Mantra. Beyond Waking, Dreaming, and Deep Sleep: Beyond, or below Waking, Dreaming, and Deep Sleep (the A, U, and M of OM Mantra) is the state of deep absorption, that is the stage to which one's Meditation practice next leads. It is called Samadhi. Meditation on Gross or Subtle: The Object on which one is meditating (and then enters Samadhi) may be Gross or Subtle. A simple example will help. If one is internally meditating on the image of a red rose, that object is a Gross object (the A of OM Mantra). Meditation may shift away from the red flower to the red color alone, the "redness". However, even that is still a Gross object of sorts. However, if attention shifts to light itself, or to the ability to see light, those are subtler (the U of OM Mantra). If attention shifts deeper to the observer who is doing the observing, or to the blissful feeling that comes from the absorption, then these are still subtler. However, in any case there is still an "object," although that object may be extremely subtle. Similarly, Meditation on a spiritual or religious object will also move through levels of experience, from Gross to Subtle, to Subtler, and to Subtle-most (the A, U, and M of OM Mantra). Eventually the inward shifting of attention reveals the essence of the object of Meditation and Samadhi. Observer, observing, and observed collapse into one: In Meditation on an object, whether Gross or Subtle, there are three parts: 1) An Observer, 2) A Process of Observing, and 3) The Object being observed. With Samadhi, it is as if these three parts collapse into only one. There is no longer an observer observing the observed; rather, there seems to be only the object. It is as if the observer and the process of observing have become absorbed into the object, such that object is the only thing left. Samadhi with, or without form: There are two general categories of Samadhi. One is Samadhi "with form" or "with object" (of which there are many types of gross or subtle objects, and thus many types of Samadhi). During Meditation, attention was directed towards this form or object, and in Samadhi, the attention becomes absorbed into that form or object. The other category is Samadhi "without form" or "without object," in which there is attention that is not directed towards any form or object (since it is without any object or form, there is not the diversity of types of Samadhi, as is the case with Samadhi on form or object). In both categories of Samadhi, the attention stance is similar. The difference is that in the case of objectless or formless Samadhi, there is no object. The stance of attention is still there, but the object is not. It is somewhat as if during Samadhi with form, one had simply forgotten the object, and thus came into objectless Samadhi. Turiya means "the fourth": Turiya literally means "the fourth," and represents that consciousness which permeates, observes, and is the other three levels. To call Turiya a "level" is not really accurate, since it is always, in fact, witness of, and at one with, the other states. Practicing the AUM Mantra: The AUM Mantra represents the four states of Waking, Dreaming, Deep Sleep, and the fourth state of Turiya. These four are the focus of attention in remembering the OM Mantra. The Transition states and the Samadhi state are less focused on with intention during the practice. This does not mean they are not there, or will not be experienced, but simply that one not making specific use of them in Meditation and Contemplation. In practicing the OM Mantra, the emphasis is on the "A," the "U," the "M," and the Silence, along with their associated realities. Consciousness permeates, is the foundation of, and in fact, is the whole of the levels of the "A," the "U," and the "M" levels. This awareness is allowed to become clearer through practice, over time. The meaning of AUM is revealed: The masters, sages, teachers, and traditions have also pointed out that to really understand this, one must do the practices and go to the Stillness and Silence oneself, wherein the meaning of AUM Mantra is revealed. I am a Wave in the Ocean of Bliss. I and the Ocean are One. Distinction between Samadhi and Turiya: There is a fine distinction between Samadhi and Turiya. Samadhi is a dualistic style of attention, while Turiya is non-dualistic, leading one to the experience "I am That," or Self-realization. There are many objects on which one can practice Yoga Meditation and enter Samadhi, and there are Gross, Subtle, and Subtler levels of objects in which one might attain Samadhi, as well as objectless Samadhi. However, Turiya brings one to Self-realization that, "I am a Wave in the Ocean of Bliss; I and the Ocean are One; I am Ocean; I am That". The pinnacle of the wisdom of the ancient sages is contained in the terse twelve verses of the Mandukya Upanishad, which outlines the philosophy and practices of the OM mantra (written as either AUM or OM). It has been said that the wisdom of the ancient sages is in the four books of the ancient most text the Vedas, the juice of the Vedas is in the Upanishads, and the juice of the Upanishads is in the Mandukya Upanishad. The entire subject of Mandukya Upanishad is AUM Mantra. It has also been widely said that if one understands and practices Mandukya Upanishad, no other teachings are needed. While nobody is likely to do that, the statement is a clear comment on the strength of this wisdom and practice. OM Mantra is also suggested as a direct route to samadhi in the Yoga Sutras (See Yoga Sutras 1.23-1.29). The teachings of the Mandukya Upanishad and OM Mantra are well worth deep study, discussion, reflection and contemplation. By faithfully and intently engaging these twelve verses, all of the other written and oral teachings can be explored as expansions of the foundation principles and practices encapsulated in this succinct summary. The OM Mantra is a roadmap of the entire process of sadhana and a most practical tool for Self-Realization. To have such a terse summary as the centerpiece of practices, it makes the context of all other practices significantly easier to understand and actually do. It is not only a most insightful writing, but also a complete outline for sadhana, enlightenment practices. 1) Hari Om. Om-ity-etad-aksharam-idam sarvam, tasyopavyākhyānam bhūtam bhavad bhavishyaditi sarvam-omkāra eva. Yaccānyat trikālātītam tadapy omkāra eva. 2) Sarvam hyetad brahmāyam-ātmā brahma soyamātmā catushpāt. 3) Jāgarita-sthāno bahish-prājñahsaptānga ekonavimsatimukhah sthūla-bhug vaiśvānarah prathamah pādah. 4) Svapna-sthāno'ntah-prājñah saptānga ekonavimsatimukhah praviviktabhuk taijaso dvitīyah pādah. 5) Yatra supto na kancana kāmam kāmayate na kancana svapnam pasyati tat sushuptam. Sushupta-āsthāna ekibhūtah prajñānaghana evānandamayo hyānandabhuk chetomukhah prājnastrityah pādah. 6) Esha sarvesvara esha sarvajña esho'ntaryāmy-esha yonih sarvasya prabhavāpyayau hi bhūtānām. Find the Experiencer: The one who experiences all of these states of consciousness is the omniscient, indwelling source and director of all. This one is the womb out of which all of the other emerge. All things originate from and dissolve back into this source. 7) Nantah-prājñam na bahih-prājñam, nobhayatah-prājñam na prājñana-ghanam na prājñam naprājñam. Adrishtam-avyavahārayam-agrāhyam- alakshanam-acintyam-avyapadesyam-ekātma-pratyayasāram, prapancopasarnam santam sivam-advaitam caturtham manyante sa tm sa vijneyah. 8) So'yam-ātmā adhyaksharam-omkaro dhimātram pādā mātrā mātrāsca pādā akāra ukāro makāra iti. Those Four are the Same with "A-U-M" and Silence: That Om, though described as having four states, is indivisible; it is pure Consciousness itself. That Consciousness is Om Mantra. The three sounds A-U-M (ah, ou, mm) and the three letters A, U, M are identical with the three states of waking, dreaming, and sleeping, and these three states are identical with the three sounds and letters. The fourth state, Turiya is to be realized only in the silence behind or beyond the other three. 9) Jagarita-sthāno vaiśvānaro'kārah prathamā mātrā. āpterādimatvād-vāpnoti ha vai sarvān kāmānādisca bhavati ya evam veda. The Sound "A" is Waking / Gross: Vaishvanara is the consciousness experienced during the waking state, and is A, the first letter of Om Mantra. That simple sound of A is first and permeates all other sounds. One who is aware of this first level of reality has fulfillment of all longings and is successful. 10) Svapna-stāhnas taijasa ukāro dvitīyā mātrotkarshādu-ubhayatvād- votkarsāti ha vai jñāna-santatim samānasca bhavati nāsyābrahmavit kule bhavati ya evam veda. The Sound "U" is Dreaming / Subtle: Taijasa is the consciousness experienced during the dreaming state, and is U, the second letter of Om Mantra. This intermediate state operates between the waking and sleeping states, reflecting some qualities of the other two. One who knows this subtler state is superior to others. For one who knows this, knowers of Brahman, the Absolute Reality, will be born into his family. 11) Sushupta-sthnah prājño makras tritīya mtr miterapīter va minoti ha va idam sarvam-apītisca bhavati ya evam veda. The Sound "M" is Deep Sleep / Causal: Prajna is the consciousness experienced during the state of dreamless, deep sleep, and is M, the third letter of Om Mantra. It contains the other two, and is that from which the other two emerge, and into they recede or merge. A knower of this more subtle state can understand all within himself. 12) Amātras-caturtho'vyavahāryah prapancopasamah sivo'dvaita evamomkara ātmaiva samvisaty-ātman-ātmānam ya evam veda. Silence after "A-U-M" is the True Self: The fourth aspect is the soundless aspect of Om Mantra. It is not utterable and is not comprehended through the senses or by the mind. With the cessation of all phenomena, even of bliss, this soundless aspect becomes known. It is a state of nondual (advaita) reality—one without a second. This fourth state, Turiya, is the real Self or true Self. One with direct experience of this expands to Universal Consciousness.